Rector - Revd. Prebendary Angela Berners-Wilson. 1st Sunday - Common Worship Communion at 11.00am. 2nd Sunday - Benefice Communion at 10.30am, the venue rotates round the Benefice..
3rd Sunday - BCP Evening Prayer at 6.00pm in the summer, 4.00pm. in the winter months, or an alternative form of worship, check the Quantock Towers website for details. 4th Sunday - Common Worship Morning prayer alternates with a Family Service, month by month at 11.00am. 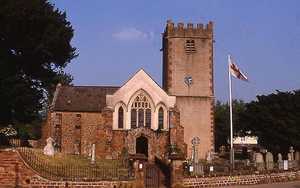 5th Sunday - Benefice Communion at 10.30am., the venue rotates round the Benefice. There is a small robed choir who sing at Morning and Evening Prayer services and a music group which plays at the Family Services. Tea and coffee is served after all morning services in the North transept, which also houses a collection of books which are available for loan. The church has a food box which collects on behalf of the Alcombe Food Cupboard. For precise times and dates of all services please see the Events page of this web site.